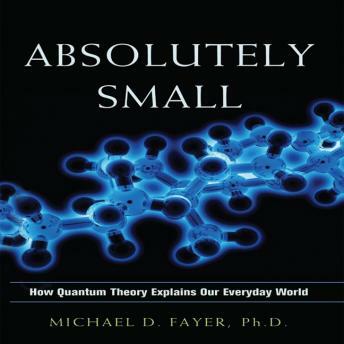 Listen to "Absolutely Small: How Quantum Theory Explains Our Everyday World" on your iOS and Android device. Our intuition about how things should behave is usually right in the everyday world. We see the baseball soar in the air, arc, drop, and lie stationary on the ground. Through data gathered by our senses and basic knowledge of the laws of classical mechanics, the motion of a ball makes perfect sense. But enter the world of the tiniest particles on earth-the motion of electrons, the shapes of molecules-and everything we think we know about the world radically changes. To understand what's really happening in the world around us, to comprehend the mysterious, counterintuitive science of the small, we must take a quantum theory view of nature. In the tradition of Stephen Hawking and Lewis Thomas, but without the rigorous mathematical requirements, Absolutely Small demystifies the fascinating realm of quantum physics and chemistry, complete with compelling accounts of the scientists and experiments that helped form our current understanding of quantum matter. Challenging without being intimidating, accessible but not condescending, Absolutely Small develops your intuition for the nature of things at their smallest and most intriguing level. Great book for beginners... gives you a real-world working knowledge of quantum mechanics and its theories. Funny thing is he says "no math" however there is indeed no shortage of equations and formulation. (: I listened twice.